A photo of the new razors. Gillette customers will now be able to order personalized 3D printed razors in a pilot program from parent company Procter & Gamble. Razor handles will be printed using stereolithography, a type of 3D printing technology from Boston-based Formlabs and people will be able to choose from 48 designs and seven colors, priced between $19 and $45, including one razor blade. A pack of four extra blades will cost $15 and orders will shop in two to three weeks from the company's new Razor Maker website. 3D printing has mostly been used in manufacturing, according to David Lakatos, chief product officer at Formlabs. "Mass customization with 3D printing is finally becoming a reality for consumers to experience end-use printed products," he said in an online statement. Gillette has used the slogan "The Best A Man Can Get," since 1989, and guys now want razors more tailored to their needs, according to P&G's director for Gillette and Venus North America, Pankaj Bhalla. 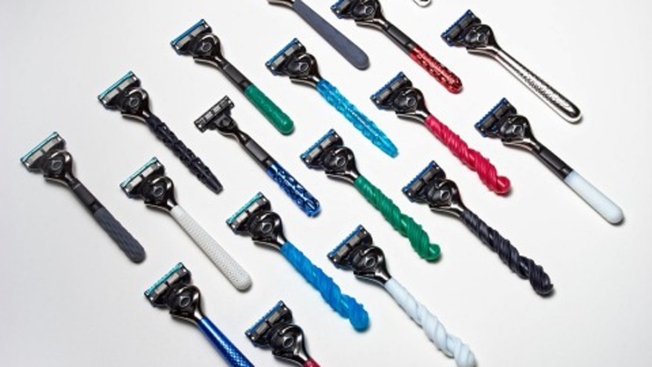 "Earlier this year we introduced a range of new razor products and declared that 'one size' does not fit all men when it comes to razors," he said in an online statement. "The Razor Maker pilot furthers our commitment to place power in the hands of consumers," he added. P&G is competing against newer rivals such as Dollar Shave Club, the subscription company bought by Unilever for a reported $1 billion in 2016. In May 2017, Gillette launched its own on-demand service and earlier this year expanded it so that people can add photos and text to their razor handles. On Tuesday, P&G was told it is now exempt from the 25 percent U.S. tariff levied on the steel it imports from Japan and Sweden for razor blades, nearly four months after its rival Edgewell Personal Care, which makes Wilkinson Sword and Schick blades, got a similar exemption. Both manufacturers said they needed to go overseas for steel suppliers, because U.S. producers cannot supply steel of a high enough grade, according to a Reuters report. This start-up has created a machine which 3D prints food from CNBC.